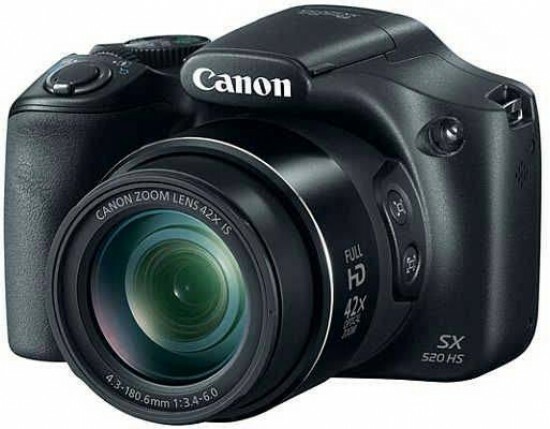 The Canon PowerShot SX520 HS is a new super-zoom camera. Incorporating a 42x otical zoom with optical image stabilisation, a 16-megapixel CMOS imager, and a dedicated movie button that enables users to easily record 1080p Full HD videos, the PowerShot SX520 HS also features Canon's Creative Shot mode that uses a combination of lighting, colour and composition from the original image to create unique, artistic images. 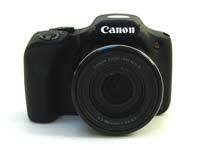 The PowerShot SX520 HS digital camera has an official retail price of £299.00 / €359.00 / $399.99. When the bulk of the current market demand seems to involve higher ticket items, are manufacturers still making budget priced super zooms in an attempt to attract the money savvy away from their smartphones? It appears so, with the introduction of two new models in the Canon PowerShot range in the 16 megapixel SX520 HS, which we’re reviewing here and which is now on general sale at a suggested £299, plus the SX400 IS, which is to follow on later and will be an Argos exclusive model in the UK. The two bridge models boast 42x (24-1008mm equivalent in 35mm terms) and 30x (24-720mm) zoom lenses respectively, suggesting a fair amount of poke for our pounds. The PowerShot SX520 HS comes with a 16 megapixel back illuminated CMOS sensor and Digic 4 processor – hence the ‘High Sensitivity’ claim indicated by the camera name – while, by contrast, the SX400 IS offers a 16 megapixel CCD. Given the all-encompassing lens reaches on offer, both cameras feature optical image stabilisation, as we would expect. Canon claims that the cameras’ handgrip/s have been made more ergonomic and DSLR-like this time around, and the moulded, rubberised grip on the SX520 HS certainly feels comfortable when gripping the camera in the palm. Also, and unusually for a bridge camera in this price bracket, power comes courtesy of a rechargeable lithium ion cell, rather than a fistful of bog standard AA’s. Hence pick the SX520 HS up and it feels surprisingly lightweight for a bridge/super zoom/all-in-one model. It may say officially a weight of 441g with card and battery inserted, but to us it at least feels lighter than that. For obvious reasons this is a camera therefore that you’ll want to grasp with both hands when attempting shots towards the telephoto end of the available zoom – and we were able to achieve blur-free daylight results this way. Although the majority of the lens retracts back within its housing when not in use, the optics here obviously dominate proceedings, meaning this is still a bulky-ish camera, even if it does take up less space than a DSLR proper with an eye-level viewfinder would – incidentally the latter is a feature this bridge camera omits. The 3-inch, 461k dot resolution back screen is also fixed; so there’s no ability to tilt or swivel to achieve more creative framing angles, which might have been agreeable, but, given the low-ish cost, this isn’t a deal breaker either. The widest 24mm still allows us to pack much into the frame, while the telephoto setting means that candid close ups of unsuspecting subjects are easy to achieve if you’re into your street photography. The all-encompassing nature of the lens reach also makes this one a perfect tourists’ camera, in providing us with plenty of framing options without the need to take a step forward or back. The SX520 HS further features what Canon refers to as an improved Zoom Framing Assist Auto mode, which can automatically adjust the zoom to maintain subjects at a pre-set size within the frame; if a subject is about to escape the confines of your framing the camera can automatically zoom out to keep them in the frame. Obviously this is for those who feel they need a bit of ‘hand holding’ and suggests itself as an ideal application for fast moving subjects; more experienced photographers may want to ignore this entirely. 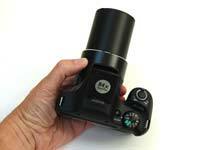 This mega zoom has further tricks up its proverbial sleeve too. For example, its Creative Shot option whereby any one of a number of on board special effects is automatically applied when firing the shutter; five additional files can be generated, each with a different special effect. Sounds fun, but again more experienced users may well find themselves reaching for the delete button. It’s also worth noting here that only JPEG capture is offered by this Canon when it comes to shooting stills, again not a total surprise given that the SX520 HS costs less than £300. Full HD 1920x1080 pixels video capture is also offered at a maximum 30fps, and there is a dedicated button provided top right of the back plate, partially set into the rear of the handgrip, for recording to commence. Otherwise photographers get the choice between manual and ‘smart auto’ settings when it comes to stills. From the front of the SX520 HS then it’s all about the lens – and the handgrip. Above the latter sits an ergonomically positioned, raised, forward-slanted shutter release button encircled by a familiar lever for adjusting the zoom, with large raised lip to the front for catching the pad of your forefinger. 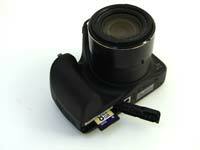 Sitting above the lens itself is a neatly hidden flash that needs to be manually raised. There’s no dedicated button to do this – instead we just grip the edges between forefinger and thumb and pull up to activate. Sitting behind the flash on the camera’s top is a built in stereo microphone, with a speaker provided on the camera’s left hand flank, if viewing it from the rear. 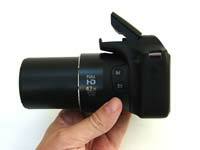 Tucked into the right hand side of the lens barrel, if viewed from the front, are two operational buttons. Other than being something to do with the zoom and framing options, it isn’t immediately obvious what these are for and the only hard copy manual provided in the box is a pretty basic getting started guide in a multitude of languages that doesn’t even offer an annotated diagram of controls. However an online download of the manual confirms that these are framing assist ‘seek’ and framing assist lock buttons respectively. These are designed to come to the photographer’s aid should they temporarily lose sight of their subject when zoomed in manually, with a press of the former button revealing a ‘zoomed out’ display, with a white frame shown around the original framing in play before the button was pressed, enabling, in theory, the photographer to re-acquire their subject and then release said button. 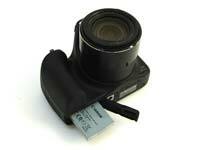 The lock button claims to help reduce camera shake at the telephoto end of the zoom, with the camera applying optimal image stabilisation for shooting at the telephoto end. Top right of these is a window for the camera’s AF assist/self timer lamp – quite powerful and prominent as it happens when shooting in low light. Moving our attention to the top plate meanwhile, and sat just behind the aforementioned shutter release button and zoom lever are a chunky partially inset command dial of the type usually found on DSLRs and pricier bridge models, plus an even more prominent shooting mode selection dial set just behind. 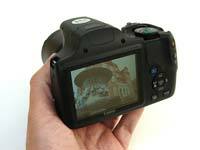 This features a comprehensive 11 options, ranging from the fully automatic point-and-shoot selections to program, aperture priority, shutter priority and manual mode choices. Among these we also get a Live View mode for real time monitoring of the results that making adjustments to images might have. A press of the display section of the rear plate control pad in tandem with this mode selected provides us with the option of tweaking exposure between light and dark, adjusting colour between neutral and vivid, or cool and warm. Adjustments are made to the left or right of screen with the visual aid of a slider control. 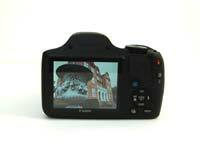 Once you have the setting your desire, squeeze the shutter release button to shoot. We are also given two auto modes on the PowerShot’s shooting mode dial. One is your straightforward ‘smart auto’ mode – point and shoot and hope the camera delivers its best, which is a reliable fallback for any first timer. The other is what Canon are calling a hybrid auto option, that allows a short video clip burst to be shot and date linked with the still image taken just before it. In practice when you replay the short clip in-camera it ends on a shot of the still and the sound of the shutter. Not exactly essential, but a neat trick nonetheless. Also to be found on the shooting mode dial is the Creative Shot option mentioned earlier. Implement this, and a burst of images is taken, with a differing visual effect applied to each. Again this feels like a fun in inessential addition to the camera. Moving around the dial we come to an option for scene modes and another for further picture effects. The scene modes here are few. We’re given a chance of Portrait and Smart Shutter – the latter taking shots automatically when it detects a face – along with high speed burst recording (whereby resolution is limited to 4 megapixels), a low light option (with results again limited to 4MP), a snow mode, plus a fireworks mode. Again, this is pretty much what anyone would expect from a Canon in this price bracket. It’s again business as usual when we investigate the effects filters being provided here, which are largely the same as those found on any PowerShot compact camera released in the past three or four years: namely the fish eye effect, miniature mode, toy camera effect, monochrome and Super Vivid options, and finally Poster Effect. Finally there is also a Movie mode option on the top plate dial, though you don’t actually have to have the camera set to this mode to begin filming – simply pressing the record button will commence video capture. Nestling next to the shooting mode dial and set into the top plate on the SX520 HS is a power button. Press this and the camera readies itself for action in just over two seconds, which is perfectly acceptable, the lens extending from its housing within the lens barrel while the rear LCD screen automatically activates. The camera is just as swift to commit a full resolution shot to memory – writing it to your choice of SD media card in around two seconds maximum. No complaints from us in either respect. The back of the SX520 HS meanwhile is clean and almost minimalist in its design and control layout, ape-ing what anyone would expect to find on a point and shoot camera and throwing in a couple of extras, such as a dedicated exposure compensation button sitting just below the one for activating video recording. Here the choice is +/- 2EV, and adjustments are made to exposure via a spin of the top plate command wheel rather than merely tabbing left or right via the backplate control pad. The other buttons here are equally straightforward and obvious, comprising a playback button, a menu button, and a drive mode button (with a choice of single shot or continuous 1.6fps capture at full resolution, with high speed burst allowing 10fps but sacrificing resolution with just 4MP offered). Between these conrols sits the aforementioned control pad, with a means of selecting ISO, flash modes, display settings and focus options (manual, macro, auto) ranged around it, and with a familiar function set button in the middle. 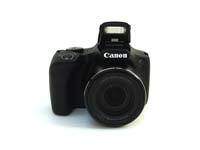 Canon has obviously stuck with the ‘if it ain’t broke, don’t fix it approach’ with this latest PowerShot. Here ISO stretches from ISO100 to a modest ISO3200, selectable incrementally, while flash options are obviously only accessible if the user has first manually raised the flashbulb. Here the options are auto flash, forced flash, slow-synchro flash or flash deactivated, with a red eye reduction/compensation mode separately selectable by drilling into the menu screens. The right hand flank of the SX520 HS meanwhile features two output ports protected by a rubber flap: here we get the familiar USB port and HDMI output, though no HDMI cable is included in the package. Canon does however include a nifty neck strap.